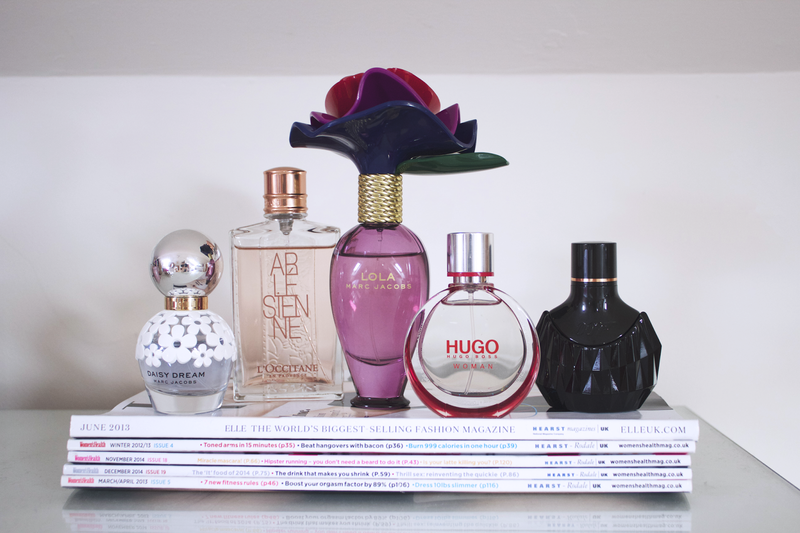 I have accumulated a large number of perfumes recently and thought I would do a post on my favourites! These would be perfect to buy someone for valentines day or maybe just to treat yourself! Marc Jacobs is one of my favourite brands for fragrances, Daisy Dream (£43.99) is one I received for christmas. It is such a lovely light, fresh and floral scent which is a perfect everyday perfume. It is similar to many of the other Marc Jacobs perfumes but I would say it's lighter, there are notes of coconut, pear and jasmine so it is a sweet and fresh fragrance. I bought a hand cream from L'occitane a while ago which was from the Arlesienne collection, I kept getting comments on how lovely the smell of it was so I went back to see if they had anything else in the collection. I found the Arlesienne fragrance (£39.00) which is very floral and sweet, I would say this is more of a daytime scent! 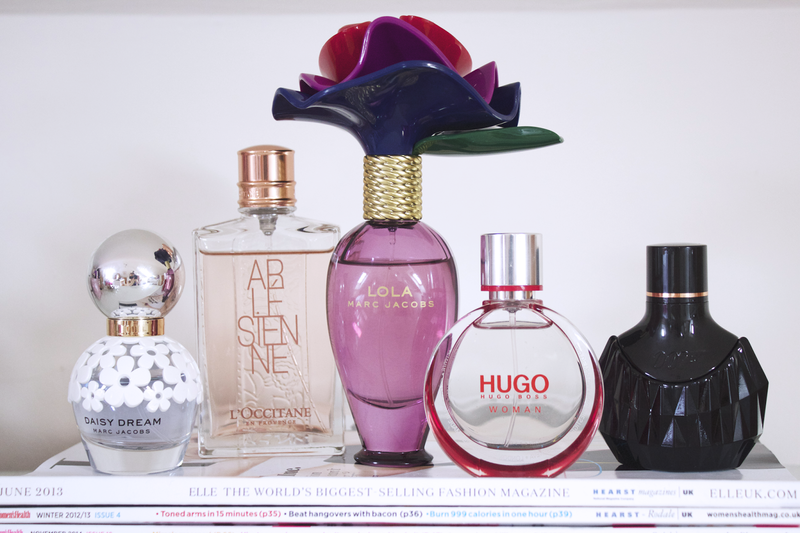 It's probably the most floral of all these perfumes and has notes of rose and violet. This lasts so well throughout the day and is such a lovely scent! Lola by Marc Jacobs (£41.99) is a perfume I first got when I was about 15 and still love! Like many of the other Marc Jacobs scents, it is a very floral fragrance, I would say it's a lot more floral than Daisy Dream, which is more fresh! In comparison to Daisy Dream, I would say this was more sophisticated and more of an evening fragrance. This has notes of peony, rose, geranium and vanilla so is very feminine. The Hugo by Hugo Boss fragrance* (£29.99) is being re-released for valentines day, so a perfect gift! This has fruity notes with an aromatic twist. There are notes of boysenberry, himalayan red grass, black tea and jasmine. I wear this as a daytime scent as it is fruity and quite a subtle fragrance in comparison to the others but is still a really lovely simple perfume! Finally is a new fragrance which launched yesterday, it's the 007 for women* (£19.99) perfume. I wasn't expecting to like this perfume as I thought it was a bit gimmicky but it is honestly one of the nicest fragrances I have ever tried! It's probably my favourite of all of these, it has notes of black pepper, blackberry, vanilla and cedar wood. This isn't an especially floral perfume, I would say it's a dark but feminine and sophisticated scent. It is perfect for both daytime wear and evening wear. I would completely recommend trying this perfume as I think it's so lovely! Daisy Dream is so nice, one of my favourite scents! I love the look of the Daisy Dream and Lola bottles. Daisy Dream is on my wishlist! It's such a stunning scent. I really love marc jacob perfumes. I have yet to add to my collection. I adore my Daisy which is very refreshing and perfect for everyday use!